Fala became famous in history as President Franklin D. Roosevelt's beloved dog and constant companion. 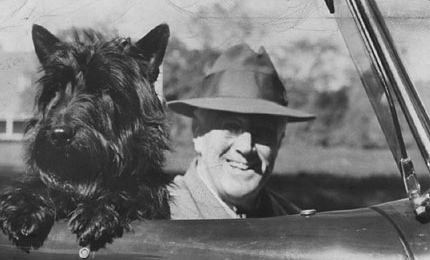 A black Scottish terrier, named Big Boy, was given to Roosevelt as an early Christmas gift in 1940 by Mrs. Augustus G. Kellog. 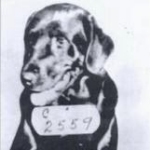 The dog was born on April 7th of that year and spent about six months with FDR's cousin, Margaret "Daisy" Suckley, before coming to the White House in November. Daisy had trained Big Boy to behave and even taught him a few tricks. 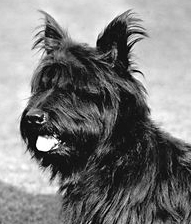 The President renamed the terrier 'Murray the Outlaw of Falahill' (nicknamed Fala) after a Scottish ancestor. 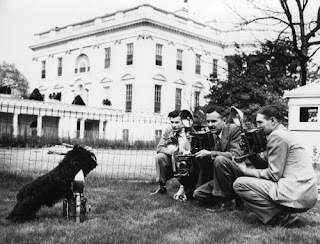 Fala quickly adapted to his life in the White House. He had a special place to sleep at the foot of the President's bed, and every morning he would have a bone brought up to him by the kitchen staff on Roosevelt's breakfast tray. Fala soon found his way to the kitchen and managed to get the staff to give him food throughout the day with his cute looks. The overeating eventually caused the terrier to have stomach problems so the President instructed the staff that only he was allowed to feed Fala. Roosevelt and Fala became very fond of one another. 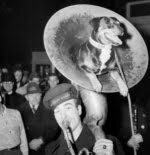 His faithful dog followed him almost everywhere he went. Fala joined him in the Oval Office while he worked, and accompanied him on official visits around the US and on overseas trips. He also went with the President to his home in Hyde Park, New York, and to Warm Springs, Georgia where FDR received treatment for his polio-induced paralysis. Fala met many famous people during his travels, including British Prime Minister Winston Churchill and Mexican President Manuel Camacho. He loved to put on a show and entertain people with his tricks like sitting up, rolling over and curling his lip into a smile. He knew how to make others smile and laugh. He once licked and tickled the bare feet of sailors that were lying down on a ship's deck trying to cool off. Another time, he amused the President and others on a fishing trip off the coast of Florida by flopping around, imitating the fish that were caught and thrown into a pile. Fala became a celebrity in his own right. He had two movies made about his life in the White House and in Hyde Park, he was the subject of a short series of political cartoons titled "Mr. Fala of the White House", and he even became an honorary private in the US Army by contributing $1 to the war effort for every day of the year. Fala became so popular that he needed his own secretary to answer the thousands of letters he received from his fans. One letter was from a poodle named Abigail, scolding Fala for not acting with more intelligence and dignity after he had chased a skunk with an unpleasant ending. 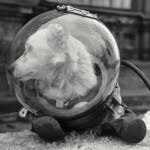 During the 1944 presidential campaign, the Republicans falsely accused Roosevelt of spending millions of taxpayer dollars when he sent a Navy ship to the Aleutian Islands to pick up Fala after he was accidentally left behind from their trip. FDR answered the attack in his famous Fala Speech while talking to the Teamsters Union. The President said that both he and his family somewhat expected malicious statements to be made about themselves, but that he had to object when such statements were made about his dog. President Roosevelt died on April 12, 1945. Fala attended his funeral then spent the rest of his days living with Mrs. Roosevelt. 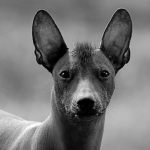 The terrier seemed lost without his beloved master. Mrs. Roosevelt took great pleasure in Fala's company, and the two became inseparable. 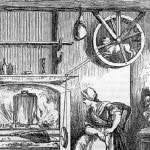 In her autobiography, she wrote "Fala accepted me after my husband's death, but I was just someone to put up with until the master should return." Fala died on April 5, 1952, two days before his twelfth birthday. He was buried in the Rose Garden near the President at the family home in Hyde Park. 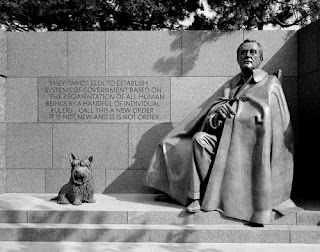 A statue of Fala sitting beside the President is featured in the Franklin Delano Roosevelt Memorial in Washington, DC - Fala is the only presidential pet with this honor.